Is Pain Keeping You From Playing Golf? Don’t let your body’s physical limitations hold you back! We can identify which parts of your body are limiting your golf game. As a TPI-Certified Golf Fitness Instructor, Dr. Elwert will develop a fitness program that will reduce your physical limitations and build on your fitness strong points. 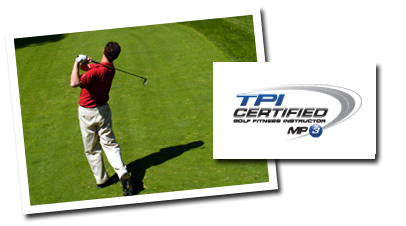 The TPI fitness program is a successful program utilized by numerous tour professionals and other golfers around the world. Strong golf performance begins with a strong body. Your body ultimately determines distance, accuracy and consistency in your golf game. We conduct a complete fitness analysis to help identify areas in your body that may be limiting your golf game. You will receive a complete fitness plan of golf-specific exercises that focus on the fundamental mechanics of the swing and the physical demands of the game. A customized fitness agenda will be created to meet your individual needs, resolve your shortcomings and enhance your strengths. I will focus on eliminating pain and postural faults with deep tissue therapy to restore the physical condition necessary for complete performance and injury prevention. You will develop a heightened body awareness that will result in increased range of motion, improved posture, enhanced coordination, better balance, increased flexibility, added endurance, superior strength and more power. To learn more about our golf fitness program or our Titlelist Performance Institute certification, visit the Titlelist Performance Institute website. Call to find out more about our reduced rates for college and high school golf team members as well as group rates.